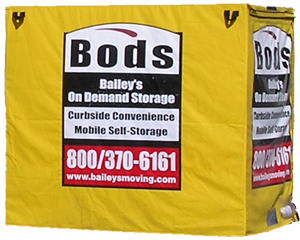 Baileys On Demand Storage (BODS) units are a great option for your short term or long term mobile storage needs. We will deliver your BOD wherever you need it, for however long you need it. Load your BOD at your convenience and when you’re done, you have the option of keeping it on site, or having your BOD brought to our warehouse and stored until you are ready for it. Whether you need your BOD delivered to your site to be unloaded, or you need your empty BOD to be picked up, just give us a call and we’ll take care of it!